2. Copy and paste the HTML, and put it on the page. 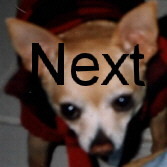 NOTE: But make sure you change Your_Name_Here, Your_email_address_Here, and Your_ID_Here, to the correct information!! When you click on 'HTML', click on 'View' and then either 'Source' or 'Document Source' You will also need to upload the images to your page. Do not link from other pages! 3. E-mail Lady Guinevere and I will look at your page to see if it follows the rules. 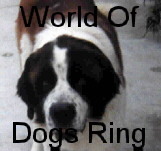 If so, you will be added to the World of Dogs Ring! Once you submit your page you will be taken to a page called "Addition to the Queue". You will see your password and your ID#. do is copy and paste it onto your World of Dogs page. You will then need to e-mail me and let me know.